I got this backpack in the summer of 2012, and I feel like I've used it long enough to write a little review on it. First, let me say that I'm usually skeptical of over-engineered gear--that is, gear that "has to" be used in a certain way. However, this backpack is NOT that way. It has many features meant for certain things (i.e. gear loops for quick draws, a pouch for chalk bags, a slot for climbing shoes, and a tarp for a rope). But, in my opinion, it has exactly the right amount of features to be helpful, instead of annoying or excessive. The bag is easy to pack. 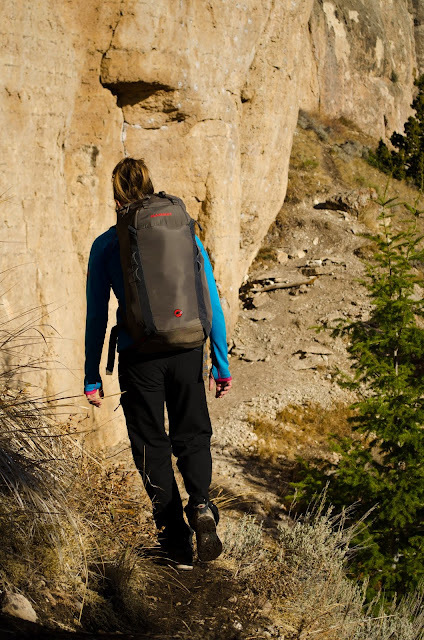 It has a wide opening on top, as well as a separate and even larger opening on the back, making it easy to stuff gear into it, and take gear out of it. 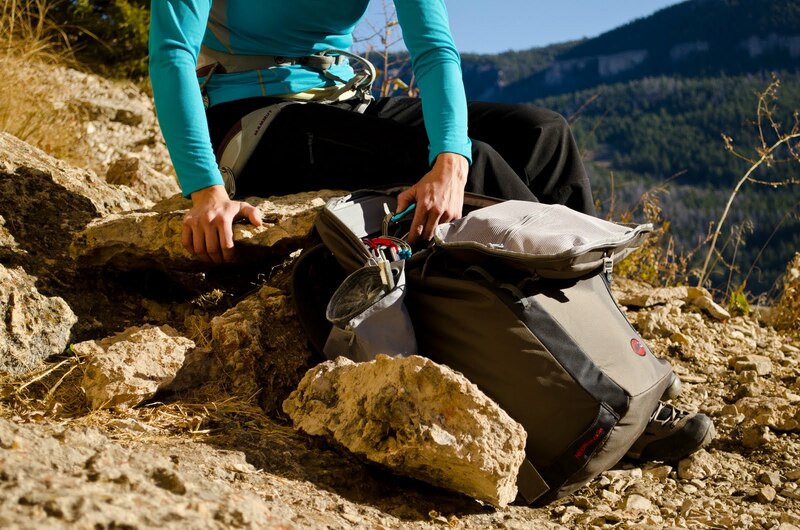 It is comfortable to carry, even with a full day's worth of sport climbing gear--that is, a rope, draws, shoes, chalk, clothes, food and water. If I need to carry more gear, I take the rope out, coil it, and strap it to the top of the bag to create more room for other stuff. Size-wise, I think it's a perfect day climbing pack. Below, see close-up photos for the pack's details. Chalk bag pouch: can be unclipped if you don't want/ need it. Keeps your other stuff free of chalk. Nice! Shoe pocket: big enough, and well-ventilated. Gear rack: can comfortably fit 12 draws and a belay device. Rope tarp: draw string closure and tabs for carrying around at the crag. The whole shebang, as opened from the back.